This is a great toy for the holiday season! We bought it for my son's 5th birthday and he loves it! Me & my husband do too! It's a lot of fun! Def requires helmet & knee pads! Most fun I've had on a trike in years! Great for kids & adults who enjoying drifting. Weight limit goes up to 160 pounds. There are no brakes, but you are low to the ground so you can stop yourself easily. Not for use on inclines. 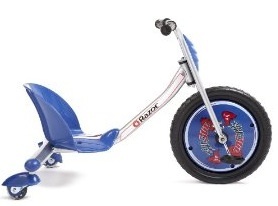 Trike has many warnings, but if used properly with monitoring & safety products, it should be safe. Highly recommend it for everyone!